Tonight we begin another fasting month of Ramadan, when we will join our Muslim friends and neighbors in not eating or drinking during the daylight hours. As much as my body hates fasting, my spirit knows that my body needs to be reminded who is really in charge here. Or as my former mentor, Lou Engle, used to say, I need to set aside lesser affections for the greater hunger of my soul for God alone. This dichotomy of flesh vs. spirit vying for preeminence is also found in my prayer life. Passing through each day, my flesh and my spirit have different agendas—one is willing to carve out a small niche for prayer, the other craves a 24/7 experience of communion with God. 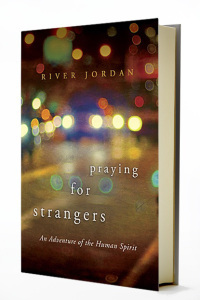 This month I greatly enjoyed reading River Jordan’s book, Praying for Strangers: An Adventure of the Human Spirit . The author sent both her sons off to war one January, and in her anxiety and helplessness, felt God draw her into an unusual new year’s resolution: to pray for one stranger every day for a year. Sometimes she prayed silently as she passed by, but many times she stopped and told the stranger that she would be praying for him/her, and was so blessed at the responses she received. Every time it was hard to take a risk, but she never regretted telling people she would pray for them. She ended the year feeling more blessed than probably any one of the people she met. One reason I love this book is because I’ve found a kindred spirit. I, too, have a habit of praying for strangers everywhere I go. But I rarely approach a stranger and tell them I’m praying. This part of Jordan’s story challenged me. Sometimes a prayer may be enough, but sometimes the encouraging word and smile of a person who is praying may make a greater impact. I hope to overcome my fears and be willing to talk to these people my heart is already praying for. On some days I pray for more than one person. Because I can. Because I want to. Because my heart has been softened by the year of connecting with the world around me. Just the other day I passed a man on his riding lawn mower wearing a white hat. He smiled and waved and I waved back, and in that moment, special stranger of the day status or not, it was my automatic response to wish blessings on his life and say a quick prayer for his health and happiness. And the rest of my day continued that way. A cashier, the woman at the insurance company, the librarian—I prayed for them all. Then I began to wonder: Could it be possible for us to move through our day on a wave of prayer, receiving and giving, offering silent words, thoughts, good intent to the people that we meet along the way? Could our cities have undercurrents of prayer that course through the business of our lives? Would there be a tangible feeling, a current that pulls at us, whispering for us to remember we are part of a larger, vast ocean teeming with life and stories? If I can begin to live this way for a moment, for part of a day, for a week at a time, then yes, I can imagine a place where people find a common ground of timelessness and understanding and goodwill. And I like that.